Welcome to Druid Hills High School, one of the oldest schools in the DeKalb County School System. Emory University founded Druid Hills School in the Fishburne Building on the Emory Campus in 1919 as a school for faculty children. In 1928, the K-11 school moved to its current site at 1798 Haygood Drive. In 1959, the elementary students were moved to Fernbank Elementary School and Druid Hills then housed grades 8-12. Between 1974 and 1976, the school was remodeled under the direction of an architect. Briarcliff High School graduated its first class in 1962 and was closed in 1987. In the 1987-1988 school year, the student body of Briarcliff High School merged with Druid Hills High School. The tradition of Baron's Hall, which was established in 1962 at Briarcliff High School, was maintained when the two schools merged. This traditional ceremony is held for the purpose of honoring seniors who have excelled in the areas of athletics, leadership, service, the arts, academics, and foreign languages. Briarcliff was closed down and converted into what is now Open Campus and the DeKalb School of the Arts. In the fall of 1996, Shamrock High School merged with Druid Hills when Shamrock was converted to a middle school. During the 1999-2000 school year, Druid Hills was renovated with new lighting, tile floors, carpeting, blinds, white boards, and the complete renovation of the Alfred Uhry Theatre and the gymnasium. Druid Hills has maintained its association with Emory University through the Druid Hills Community Consortium. The consortium consists of five institutions: Emory University, Druid Hills High School, Fernbank Elementary School, Fernbank Science Center, and Egleston Children's Hospital. The five institutions share educational resources, both human and material, among pre-kindergarten through adult learners. Emory University also serves as Partner in Education for Druid Hills High School as well as Fernbank Elementary School through the Partners in Education Adopt-a-School Program. In May of 1994, the Druid Hills Community Consortium received a Next Generation School Project Grant to implement a fiber optic network that linked the Consortium sites for the purpose of providing two-way interactive distance learning opportunities. The fiber network allows students at Druid Hills, Fernbank, and Egleston to attend class at any of the Consortium sites. This has also allowed students who are hospitalized at Egleston to attend classes at Fernbank Elementary, Fernbank Science Center, or Druid Hills High School. In 1998, Druid Hills raised money to fund the renovation of its auditorium. The auditorium was renamed for Druid Hills graduate and award-winning playwright, Alfred Uhry. The auditorium is now a teaching lab for instruction in fine arts: theater, music, and dance. The facility is also available for community productions. Restructuring the school day to a 4 X 4 block schedule to provide extended blocks of time for teaching and learning. Implementing an attendance policy to ensure students' success; students who miss more than six classes do not receive credit. Including students and parents in shared decision making via the Governance Council. The charter ended in 2002 and was not renewed. In 2004, Druid Hills applied to participate in the International Baccalaureate programme. Our school received acceptance into the program on July 9, 2004 with authorization to begin the program in the fall of 2004. The International Baccalaureate Diploma Programme is a two-year program for 11th and 12th graders who want an academic challenge and a diploma recognized by universities throughout the world. Students earn the diploma by taking six subjects and doing three special features: an "extended essay," creative active service to school and community, and a course called Theory of Knowledge" meant to stimulate critical reflection on learning and experience. The Fishburne Building was located near Clifton and N. Decatur Road. The building, known as The Emory School, served as an elementary school for the Emory neighborhood. It was torn down eventually to make room for the Goizueta Business School. T. T. Fishburne, who served on the board of the Methodist Church, willed $29,000 for the constuction of the school. 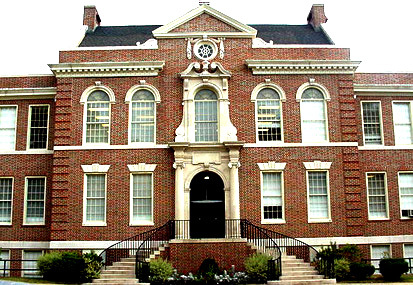 The Emory School was the start of Druid Hills High School.